The Octavio Frias de Oliveira Bridge in São Paulo did succeed in what was apparently its main purpose: creating a global city image for São Paulo while covering up the city’s severe contradictions and conflicts. Considered by architects a great failure due to a number of reasons – from its patent ugliness to its inability to operate on an urban scale – Octavio Frias de Oliveira Bridge did succeed in what was apparently its main purpose: the endeavor of creating a global city image for São Paulo while covering up the city’s severe contradictions and conflicts. Octavio Frias de Oliveira Bridge – named after a Brazilian businessman responsible for creating one of the most influential media organizations in Brazil, the conglomerate Grupo Folha – was inaugurated on May 10th, 2008. The ceremony, attended mainly by politicians and high profile businessmen, was accompanied by a small demonstration against the prohibition of pedestrians and bicycles on the bridge. Access point to the bridge: no pedestrians or cyclists allowed. The exclusiveness given to individual transportation is not only startling due to the inexistence of bicycle lanes or sidewalks. Rather than being an urban bridge – characterized by the flow of pedestrians, bicycles and public transportation, along cars in lower speed –, this particular cable-stayed bridge was conceived as a piece of metropolitan-scale infrastructure, connecting expressways instead of neighborhoods. 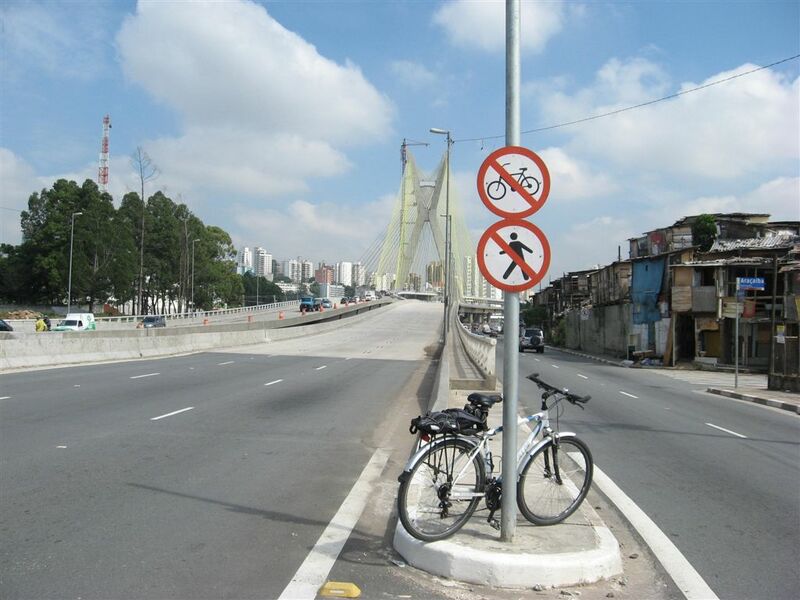 As a result, the bridge is (yet) another infrastructural element in São Paulo that provides articulations in a large scale – and in this case only for individual transportation – while undermining local accessibility. In a city already jammed by its excessive number of cars, and where the average distance between bridges over the city’s main rivers is around 2 km, should we really invest such a large amount of government budget – $113 million, at the time – in an extravagant public work that doesn’t even connect the neighborhoods in opposite river banks, or allow people to cross it by foot, bicycle or public bus? Map of São Paulo’s centralitie. The construction of Octávio Frias de Oliveira Bridge was part of a larger process initiated by the Água Espraiada ‘Urban Operation’ (a legal instrument for urban policy), which intended to create a new tertiary centrality in São Paulo. 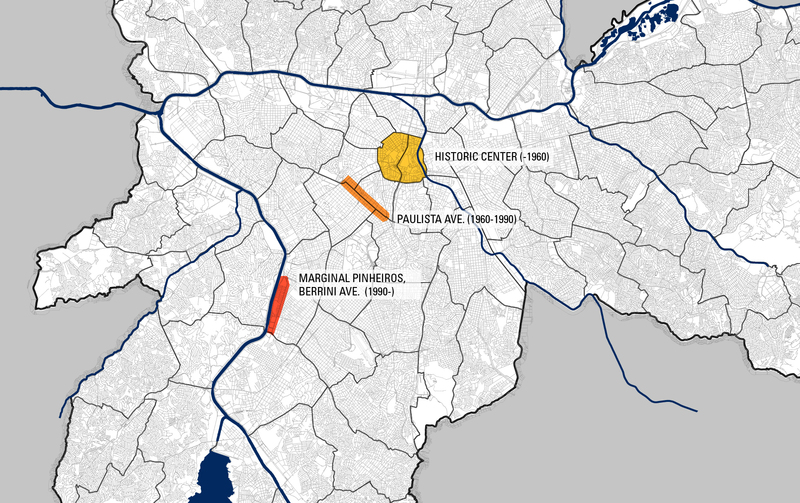 This new designated centrality would be developed on the lowlands of the Pinheiros River, once a large swamp with very cheap properties (whose prices, as a result, grew exponentially in the last two decades). ‘Urban Operations’ allow for great transformations in a specified area by means of associations with private investors. In these areas, urbanistic regulations such as floor area ratio can be much higher upon payment of an ‘onerous grant’. The accumulation of grants generates funds which should be invested in the same area, providing infrastructure, social housing, public spaces and other items which are not commonly provided by the real estate market. Demolition of Jardim Edite favela and surroundings. In the case of ‘Urban Operation’ Água Espraiada, most resources were invested in road infrastructure, undermining the importance of providing social housing for the large number of local dwellers who had been displaced. Six times more money was spent on the bridge itself than the complex with 252 social housing units and public facilities (nursery, restaurant-school and health center) that has been recently – and still partially – inaugurated. Whereas all the favelas in the area were demolished, only ca. 5% of the local dwellers remained in the area, relocated in this new complex. The vast majority, however, ended up expelled and moved to other favelas in the city’s outskirts, out of the elites’ sight. Octávio Frias de Oliveira Bridge worked out as an anchor project in the redevelopment of Berrini Avenue as a new centrality in São Paulo. Within a complex of corporate architecture buildings along the Pinheiros River, it created the perfect scenery for São Paulo to be seen as a global city, with a prominent, competitive and attractive economy. 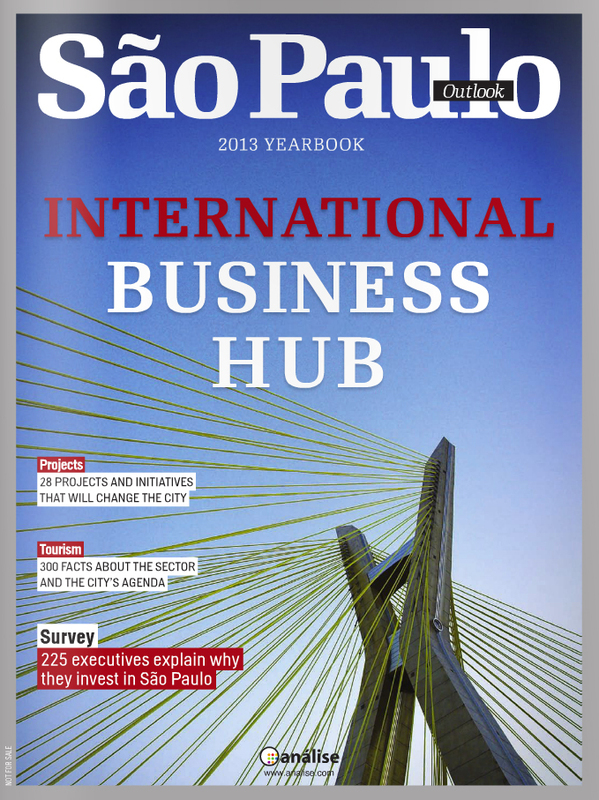 São Paulo Outlook Magazine 2013 cover: an icon of São Paulo as a global city. The idea of a global city, conveyed by this glaring landscape – identical to many others around the world –, was imposed as a consensus by the city’s main actors. Fascinated by the idea of possibly living in an ‘alpha city’ such as New York, London or Tokyo, most of São Paulo’s population legitimized this disproportionate public expense. The Cable-Stayed Bridge, as it is most known, is now cherished by most of the paulistas as the city’s main postcard. 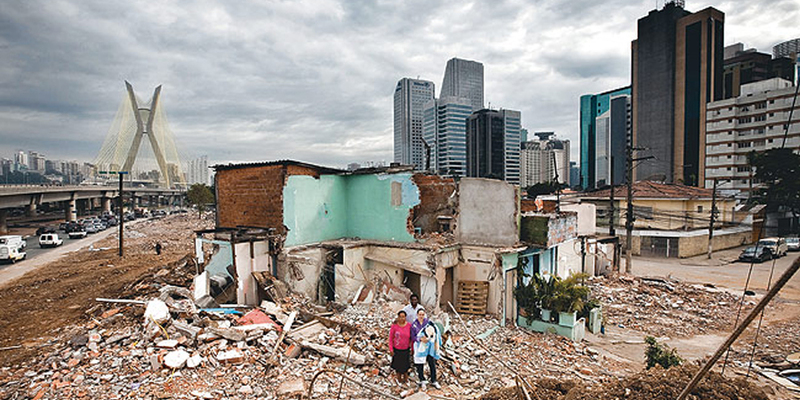 There is, however, a huge gap between this image of São Paulo as a global city and the reality it tries to hide: a city with deep contradictions within its urban conditions, where social differences can be radically steep. The undertaking of building this bridge while sweeping out of sight the favelas and its dwellers and looking down on urban mobility and connectivity reveals to what extend it is still possible to broaden both social and physical distances in São Paulo. Marcela Ferreira studied architecture and urbanism at the University of São Paulo and is currently working on urban projects at Vigliecca & Associados, in São Paulo. She has previously collaborated with OMA in Rotterdam and New York. Giselle Mendonça studied architecture and urbanism at the University of São Paulo. She previously worked at the architecture office MMBB and is currently working at SP-Urbanismo, a public company alongside the Department of Urban Development from São Paulo. Fenanda, you couldn´t be righter. Perfect comment. It is quite easy for a lot of hipsters to start talking about transportation in a huge city like Sao Paulo as if it was Amsterdam. Sao paulo is not a bike friendly and it wont be for a very long time, at least not for the ones which would really take advantage of it. There are lots of hipsters in upscale neighborhoods (Vila Madalena, Pinheiros, Jardins) making huge noise to have bike lanes around, that s super cool, but what's the point? These people don’t even use public transportation, they in general work and live on these upscale neighborhoods and in order to play european cool they want to cycle the 1 km between their home and their offices instead of walk..that's wonderful, I would like to swim to my office daily, can someone build a swim lane from my apartament to my office in jardins? I surely would stop driving my suv on a daily basis for 3 km, can you realize what a huge different that would make to SP entire transportation ecosystem? Why don't you guys ask someone from Parelheiros if he/she is willing to cycle 20, 30km to reach Avenida Paulista twice a day? These are the peiple eho can talk about transportation sprcially public transportation and I bet you they are not concerning about not being able to cycle on the bridge, there are many most important things for them to be concerned about.